If you own a fast food restaurant, street food stall or a food truck then operating your own website alongside your social media campaigns can really help drive more customers to your business. By creating your own website, you are able to let your customers stay informed about your location, opening times and view images of your tasty food. By combining your website and social media marketing strategies, you can really help raise revenues and build brand awareness. To get started with your own website, we recommend you use WordPress as it is free to download, simple to install and hosting options are plentiful. 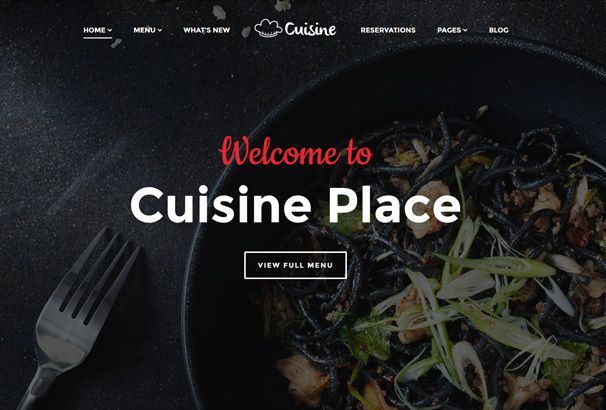 This collection contains over 30 hand-picked WordPress themes for creating a website for your food truck, food stand, or any other type of street food or fast food establishment. They are well-designed, modern and will look good on any size screen – so don’t worry about people not being able to view your site on mobiles. MyCuisine is a really tempting offering which is ready to serve up some eye-catching visuals with a definite Tuscan flair. Though specifically built with restaurants in mind, this small business friendly theme from WordPress can easily be adapted for any business looking for a laid back vintage aesthetic for their website. Of course, no restaurant website can be complete without a menu and MyCuisine’s menu page template gives your customers access to a full online menu and is incredibly simple to use. The location page lets your visitors know your business’s address, hours of operation and contact information whilst the page template comes complete with Google maps integration. MyCuisine also offers four unique color schemes to the discerning restauranteur so why not make it your dish of the day? Every food lover is well aware of the explosion of the popularity of food trucks in recent years. Mouthwatering online images from food truck sites tempt us to hunt them down in cities and towns across the country and the Bettasso theme is tailor made with just this purpose in mind. 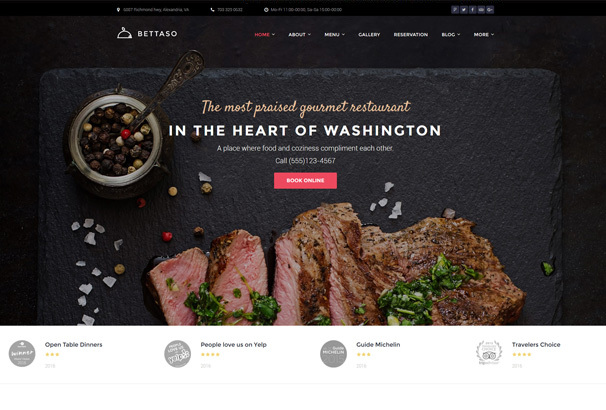 Also suitable for use by standard restaurants, Bettasso offers many different customizable layout options to enable you to tell your own food story in your own way. This theme also allows for various content types to be added to your page such as buttons, images, pricing tables, contact forms and sliders so your website can be uniquely and authentically yours. So why not let Bettasso help you create your very own food truck frenzy? It’s what it does best. The contemporary and image centered Gulliver theme allows for your best culinary creations to be showcased to absolute perfection. Suitable for use by food trucks, cafes and pop-up restaurants, Gulliver will whet the appetites of your readers like few other themes by displaying your dishes in their very best light. With a fully customizable range of features on offer including a built in Google map to display the specific location of your business, it will be easier than ever for visitors to find you and enjoy the best of what you have to offer. 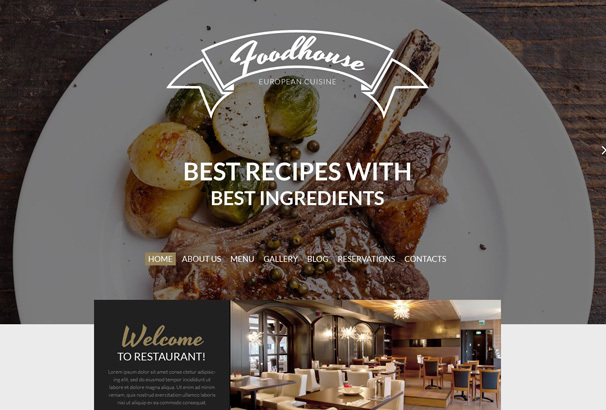 Encompassing a user friendly design together with lightweight code for super fast loading times, Food House could be the tasty template you have been looking for. Ideal for showcasing your food business to its best advantage, this one comes with a range of really great features including photo rich galleries and an integrated blog section. Diners are also given the option of making a reservation online, making life a little bit easier for you and for them. 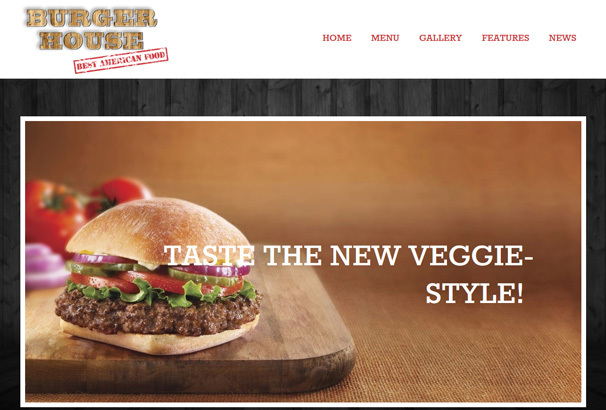 Burgers are big business and the tailor made Burger WordPress theme is a streamlines and clean option specifically crafted with fast food restaurant and food truck owners in mind. 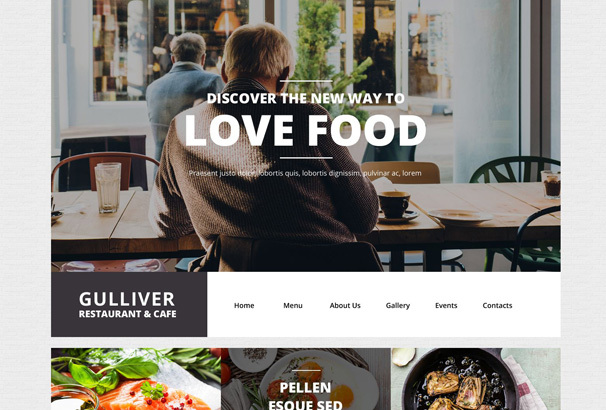 The super flexible and responsive theme comes with a condensed but highly effective range of features to allow you to promote your food business to its full effect. The Burger Theme is built on Twitter Bootstrap Framework and can therefore be viewed easily on every device including tablets and smartphones so your WordPress theme can really be as fast as your food. Another WordPress theme specifically built with all things edible in mind, FOOD enables you to create a bespoke restaurant, candy shop. pizzeria or ice cream shop online. 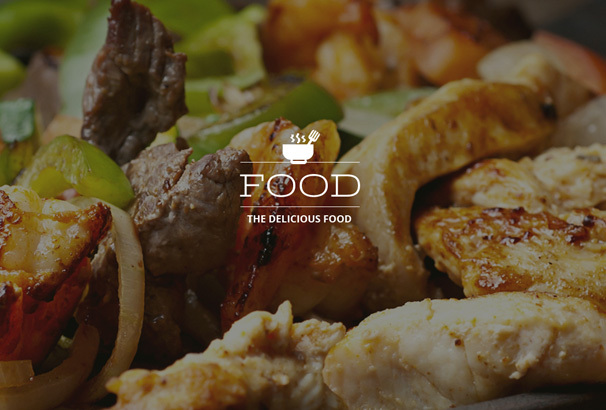 Boasting a wide range of impressive features including a comprehensive visual menu and some of the most beautiful typography we offer,FOOD is the really modern, minimal, multi-purpose solution to your specific website needs. Complete with full cross browser compatibility and the premium slider plugin as standard, FOOD will allow you to create a custom website as commanding and classy as your eatery. 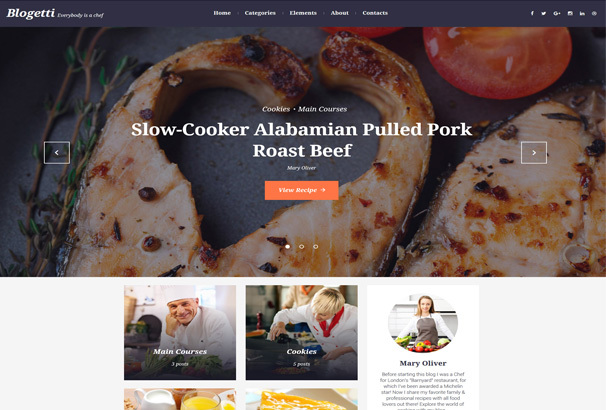 Blogetti is another premium ultra contemporary WordPress theme designed with the needs and wants of food shops, trucks and bloggers specifically in mind. Your business will soon be everyone’s if you choose this blog theme which comes with a fully customizable range of easy to use features. Designed with readability and best user experience in mind, Blogetti really gives you the power to supercharge your salads and exhibit your entrees. Boasting an extensive range of fully customizable color and layout options, this beautiful and modern theme is perfect for exhibiting all of your recipes and food related articles. With 19 different modules to choose from, a beautifully bespoke site can be just a few clicks away with some assistance from Florentine. Boasting popular features such as the 5-star rating and bookmarking system and a distraction free cook-mode, Florentine is guaranteed to both impress and delight your audience. 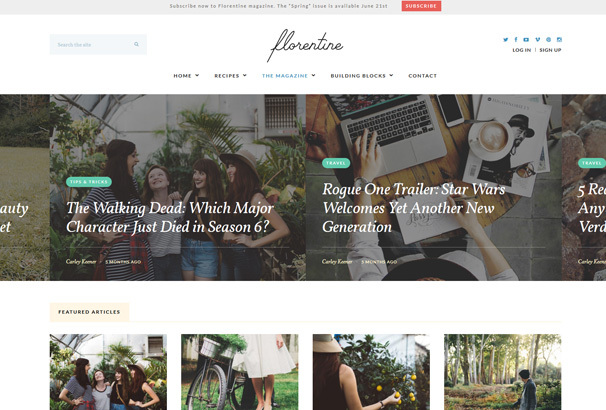 If you are looking for a truly elegant and adaptable site, Florentine could be the one for you. The ultra clean and professional Food WooCommerce Theme is tailored to meet the various needs of online food, hotel and restaurant blogs and stores. Its range of great features include a 100% Responsive Layout and superior color combination. It is also SEO (Search Engine Optimization) friendly and comes fully optimized to enable fast loading. 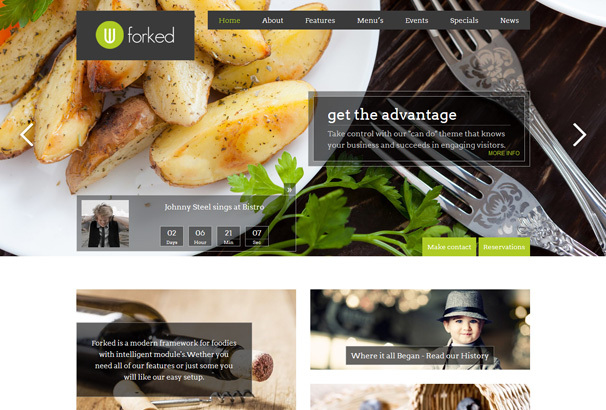 Showcase your food business in real style with this fantastic theme. 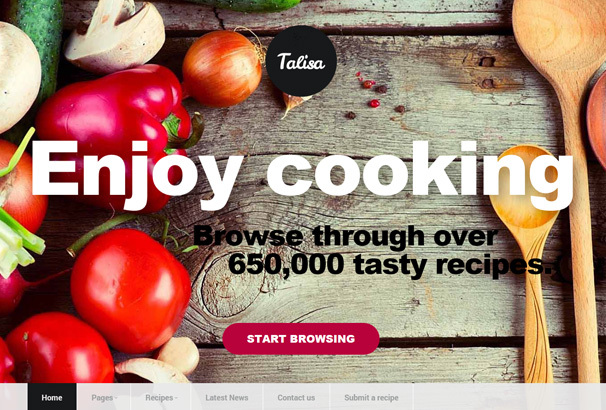 Tantalize their taste-buds with Talisa, the easy-to-customize and fully featured WordPress Theme. Each purchase of this theme comes complete with a detailed help file and additional features like Recipe Favoriting and a Front End Recipe Posting Form.Recipe Favorites: Users can then bookmark their recipes and these will be saved to their profile page as well as to an optional widget. Unlimited highly customizable color schemes and a responsive layout add further to Talisa’s appeal so why not start to take advantage of what she has to offer today? The unstoppable emergence of food trucks onto the culinary landscape brings with it the need for tailor made themes. 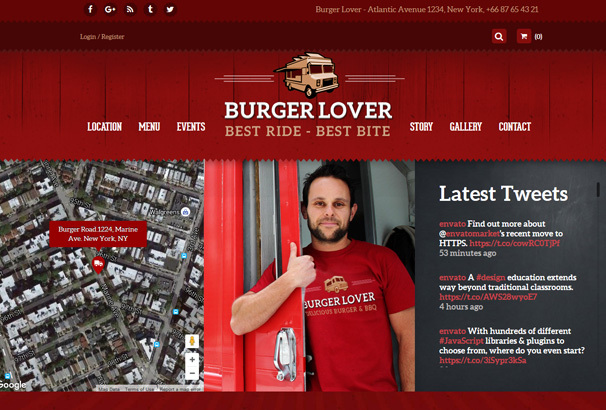 The Food Truck theme is just that, a custom built carrier of truck site specific content. 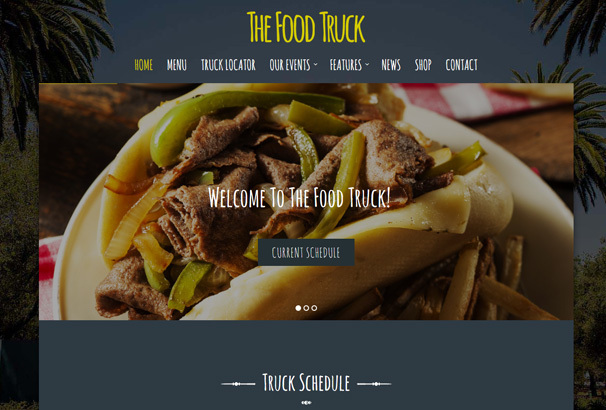 Boasting a whole host of features including unlimited colors and mega menus The Food Truck WordPress theme also comes with a built in truck locator map which will make your customers aware of your location at any given time. And when they know exactly where you are, they’ll know exactly where to come. So you had better prepare for the influx! Another theme catering specifically to the current food truck craze is Lunch Box which also comes complete with an interactive Truck Locator Map to let your customers know where to queue. 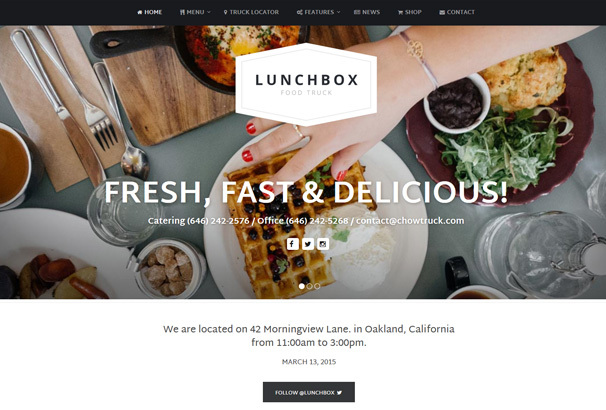 Lunch Box can also be used by other eateries and comes with a great range of features including a menu page builder element and fully customizable theme options. So why not start to fully showcase your food truck or restaurant offerings with Lunch Box? There is often beauty to be found in simplicity and the Foodtruck Streetfood Template comes as a One-Pager and Multi-Page WordPress Theme. Best suited to trucks or cafes with a more limited or straightforward menu, this theme will allow you to promote your business with great clarity. Minimal but effective features come together here to ensure a user friendly experience for both the reader and the blogger. 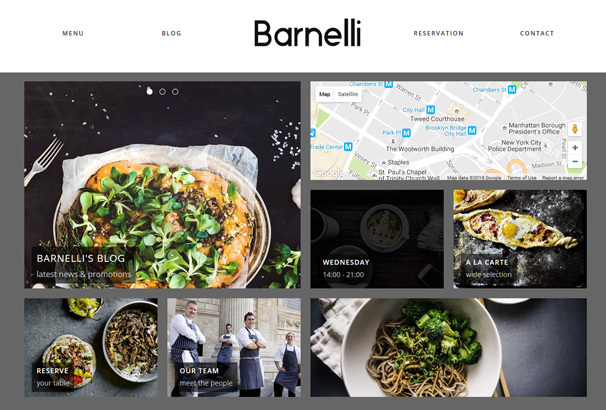 The minimal and highly responsive Barnelli Wordpress theme is very well positioned to fulfil all of your foodie requirements in one easy to use package. Specifically designed and coded for food business, Barnelli would serve a small café or fast food restaurant equally well through the provision of its range of highly adaptable features which include a revolution slider as standard, full screen video, and social icons/plugins. Barnelli really is your one stop shop for all of your food site theme needs. The clue is in the name with Forked, the solution for smart thinking Restaurants, Bistro’s, Hotels, Clubs and Foodtrucks. In fact anyone in the food or event industry would benefit from this multi faceted WordPress theme which is built on the unique Croma restaurants and events framework. It’s features include unlimited colors, countdown timer, galleries and contact forms as well as a built in Google map street view to let your customers know precisely where you are. 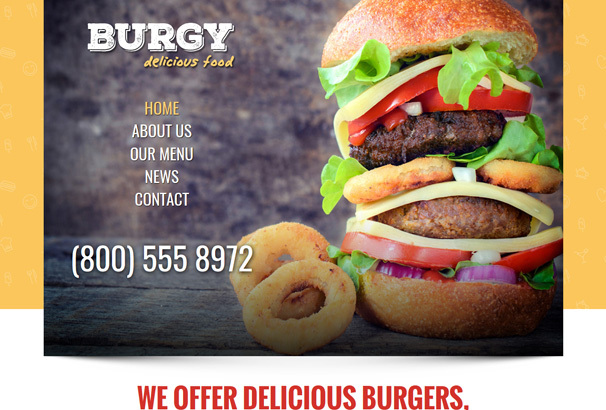 Burgy is WordPress theme formulated especially for fast food restaurants. 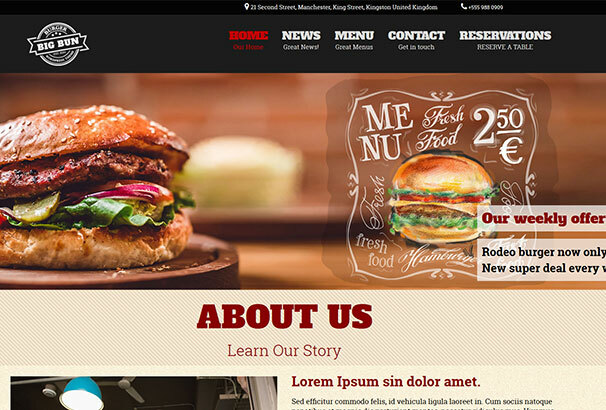 This fully responsive theme enables you to highlight your fast food business in a simple but very effective way. Mouths will certainly water if you choose Burgy, your no nonsense straight talking WordPress blog theme. 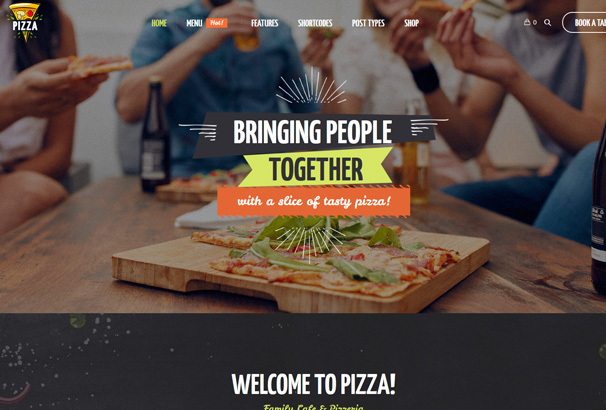 Custom menu functionality is just one of the many great features offered by the Pizza WordPress theme which can be utilized to great effect by pizzerias but also by fast food websites, food trucks, bakeries and others. 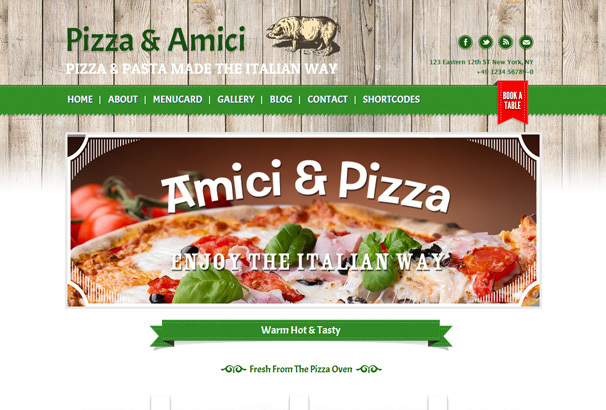 Showcase your best dishes in the very best way with the fully customizable Pizza WordPress theme and begin to see the benefits for your business. 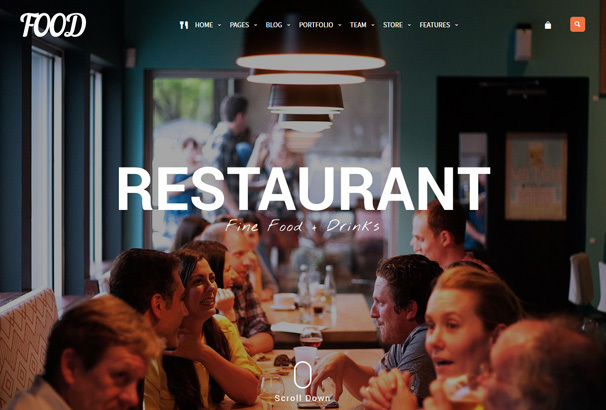 Built for restaurants and food lovers, Delimondo is a WordPress template which looks equally fantastic across all devices. Customizable and effective features combine to showcase the very best of your business. Let Delimondo get to work for you today. 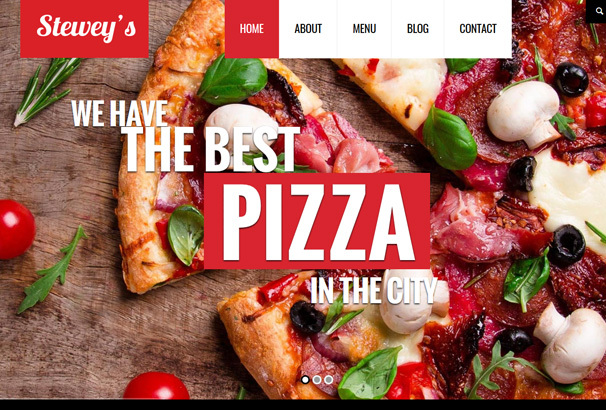 An SEO friendly WordPress theme for fast food companies and others , Steweys really has everything you need in order to help your food business to thrive. Your amazing food will become the star of the show if you decide to utilize this theme which comes complete with many helpful features. 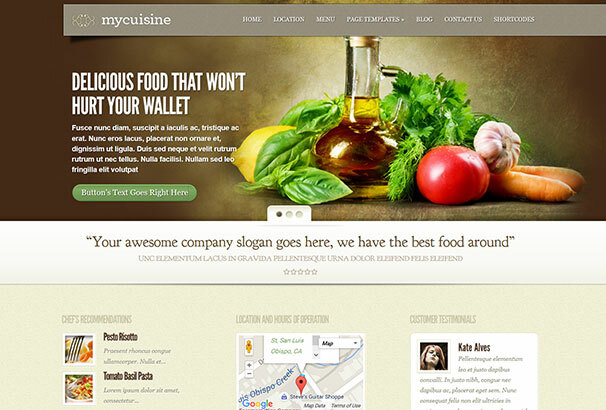 The classy and streamlined Cuisine WordPress theme is designed with restaurants and other food sites in mind. If you own or operate a food truck,restaurant, café or any business related to food, the image heavy Cuisine theme is best placed to show your customers just what’s on the menu. 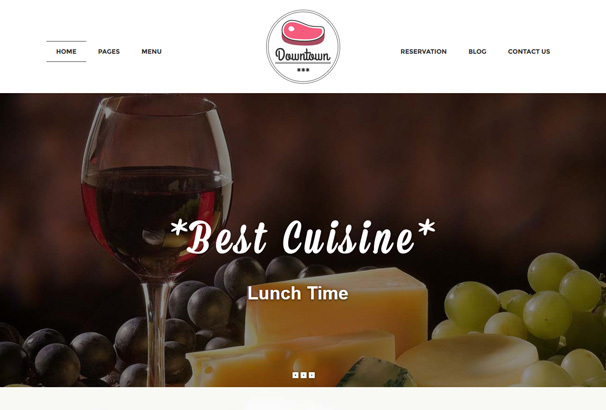 Highly customizable colors, fonts and background combine to make Burger House a great WordPress theme option for only for purveyors of burgers but also for many types of restaurant. Its ultra simple design and pared back features allow your food to take center stage, right where it should be. Featuring a range of key template features, Downtown is the sophisticated WordPress theme solution for your business. A range of unique effects combine to make Downtown the natural choice for the savvy restauranteur. If you need more info, please contact me.